New post over at my home design blog! 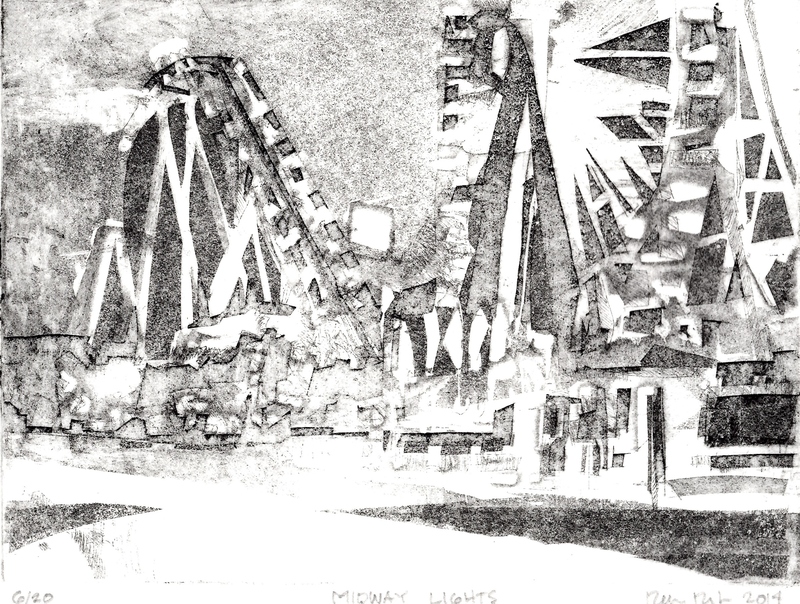 Here is a picture of the original copper plate used to print Midway Lights. Notice the image is reversed from the actual print. 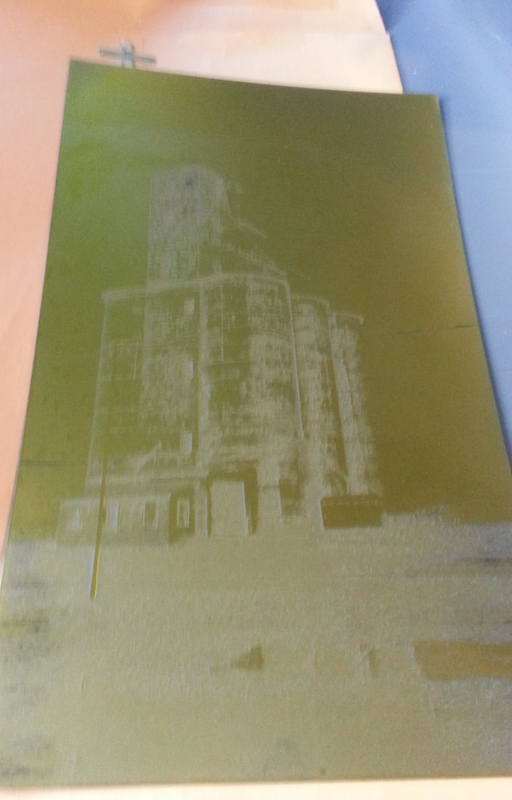 I love the reversal of image when printing! I can’t wait to pull a print the first time! Just as we read left to right an artist has a certain way of creating images. 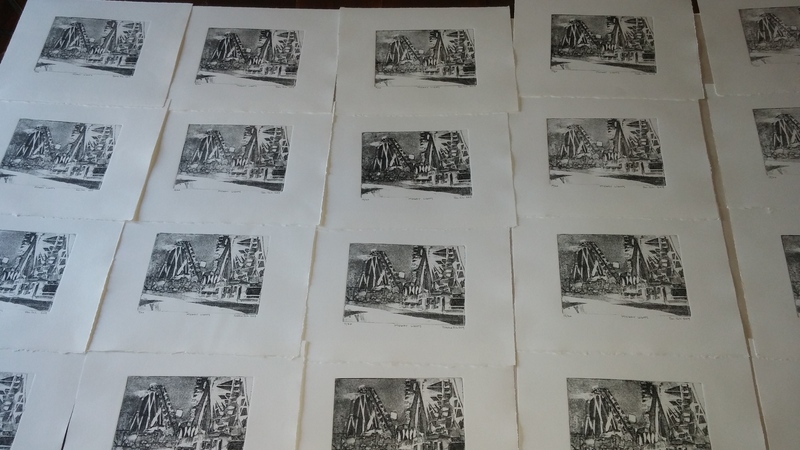 I tend to balance right so printmaking has taught me an entirely new way to create images! The edition is complete and signed at 20. I need to change, scar or deface the plate so additional identical prints of the original 20 can not be printed. I took a beforehand keepsake picture as I will soon alter the plate. Here is a picture of number 6 out of the edition of 20. It is etched on copper 6 x 8 printed on BFK white. This print was created during a class at the Lawrence Art Center. 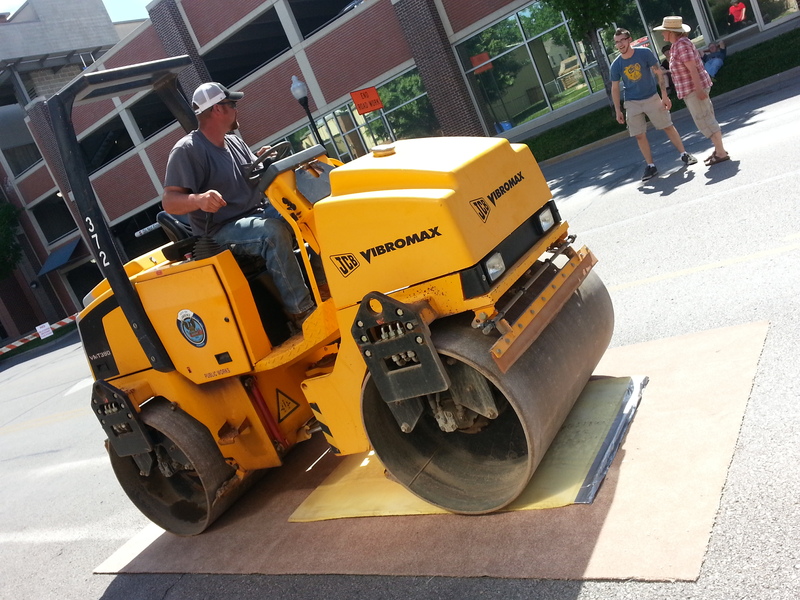 The finale was May 30th 2014 when a Steam Roller was used to print the plate during the Art Tougeau event. Step one is figuring out the image! Whew this is the stressful part for any artist. 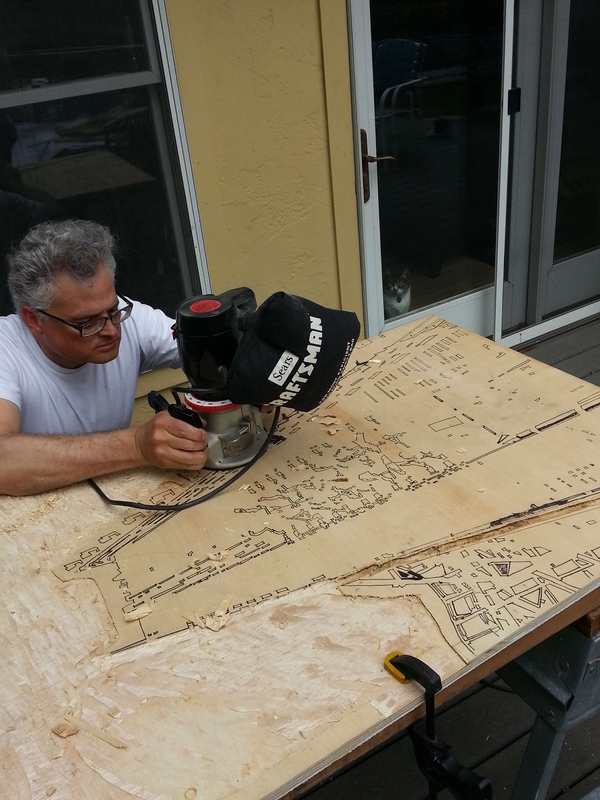 A wood cut is an image cut into wood in our case 32” x 48” piece of plywood. 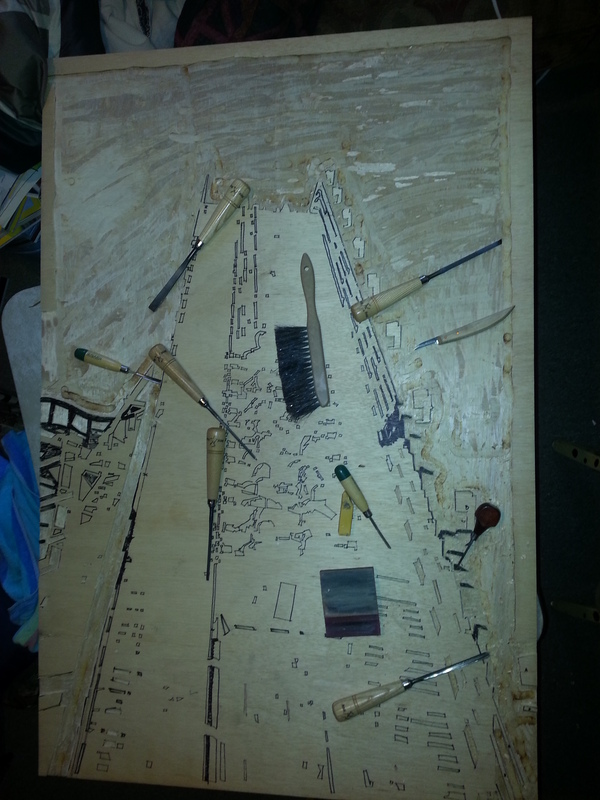 Every place that is cut or the top layer of wood removed will not hold ink so that is white or the color of the paper. I think of it as the cut away area is protected from ink. The roller that applies the ink doesn’t touch anyplace that is recessed. 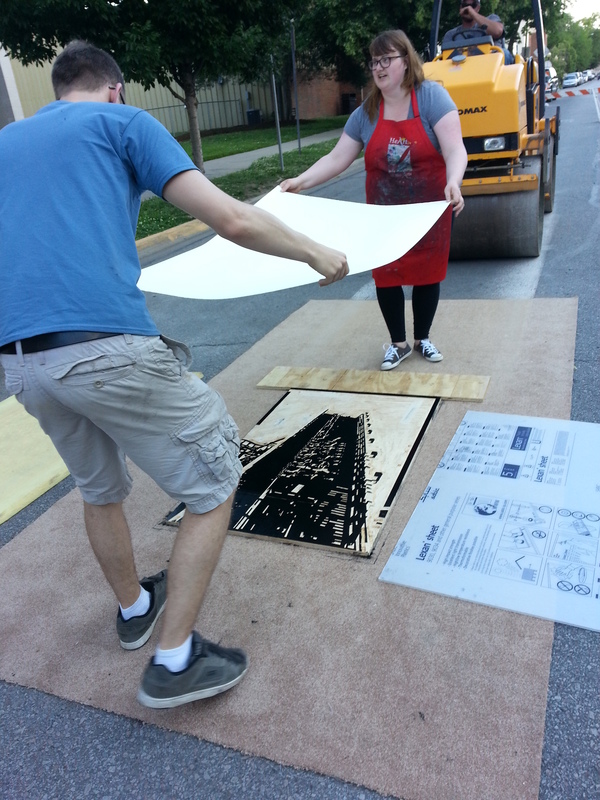 For this Steamroller class the plate will be printed once so we have one color the black printer’s ink. The image will be black and white no gray or any other color. I have been described as a colorist “a painter able to achieve special effects with color”. As a printer who LOVES color that meant I needed a strong image that didn’t need any color such a blue sky or a middle gray to explain depth or distance to tell the story. As an architect too I tend to imagine the finished piece of art just as I can see a building project while it is being designed. 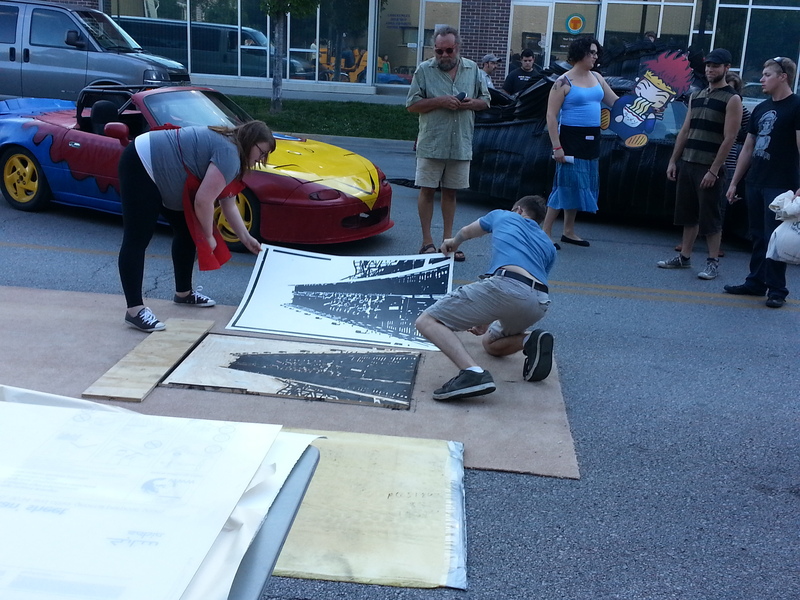 Knowing that a steam roller was going to print it meant that fine lines may not work well as the sheer compression from the roller may smudge them out. Also in the back of my mind was a comment from an art show opening I had last fall from someone viewing my work “You seem much more fun that your work shows. Your work is somewhat dark and moody” Ugh I do like light and dark but have been wanting to lighten up! Also knowing that this was going to take many weeks with MANY hours to carve I wanted an image I wouldn’t tire of. I try to bring my family into my work too either by having them take picture with my camera phone or pick an image I have taken. I searched through the hundreds of images on my phone and decided that a picture from spring break at Silver Dollar City with the entire family would be fun and bold enough to keep me going for weeks. 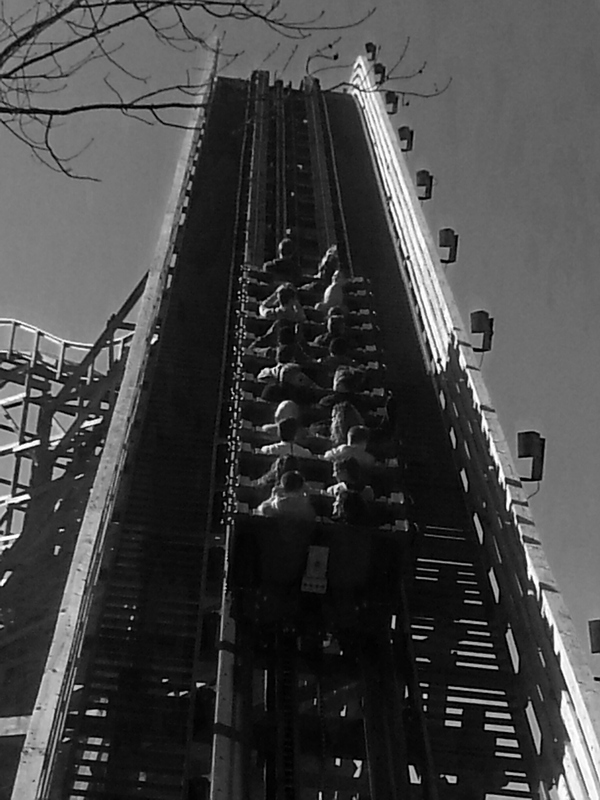 I took this picture of my family riding the new OUTLAW RUN roller coaster. I waited on the viewing platform! Big roller coasters especially ones that go upside down are not for me anymore! 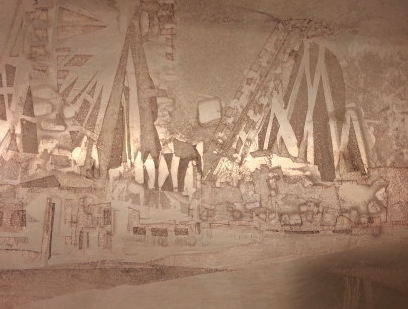 I do think the combination of a picture of a new wood roller coaster using a wood plate printed with a steam roller is fun! Image transfer. I took the image and printed it full size using a printer/copier that prints architectural drawings to scale in black and white. 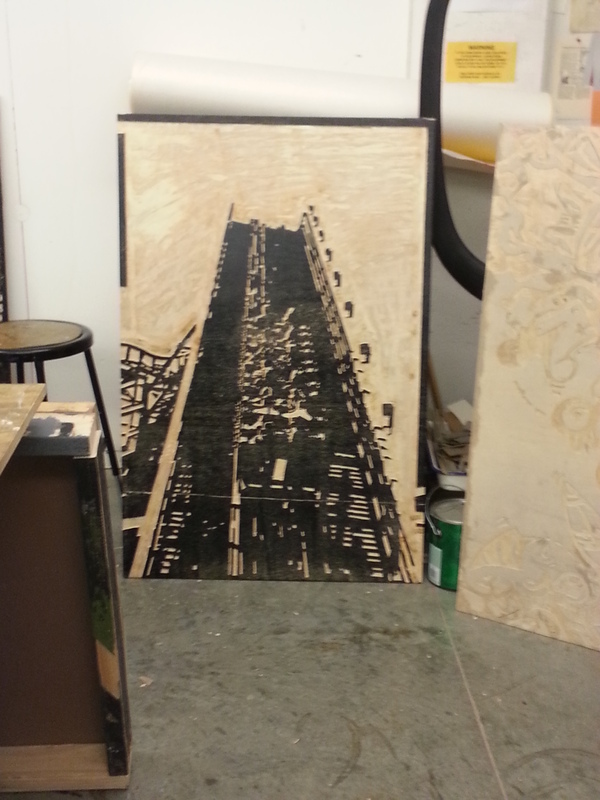 Using the drawing at full scale I transferred it to the plywood using transfer paper. I teach a first year Architectural Studio at UMKC where we have a two week sketch workshop focusing on drawing technique. Angular lines are powerful is one my favorite sayings! If you notice most of the lines are straight and at right angles very few curves. It keeps the drawing crisp and not fuzzy or fussy! After the image was transferred to the board I outlined everything with a sharpie and colored some areas that were tricky to know what was going to be cut. Going from color to back and white requires taking liberty to ensure that the image can still be understood. Carving! This took quite a bit of thought before we started. The we being my husband plus me! There was so much white we needed a plan on how to clear away that area of the board. We could have cut the board to that shape but we wanted to keep the board a rectangle. We experimented with a router. It was quick and easy and if we had more bits might have used it for more cuts! More carving the large areas were cleared with a router now came the detailed fine hand cut areas. 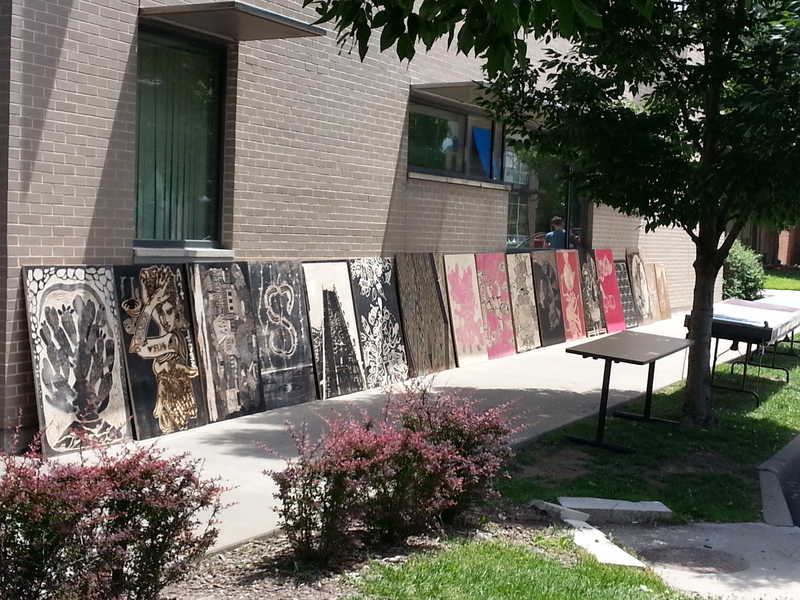 Carved plywood and MDF plates waiting to go at Lawrence Arts Center! Paper being placed on plate, centered aligned and straight! Steam roller. Standing on plate until steam roller engaged it keeps it from sliding and smearing ink! paper pulled off plate! IT PRINTED!! Finished print! still wet needs to dry. 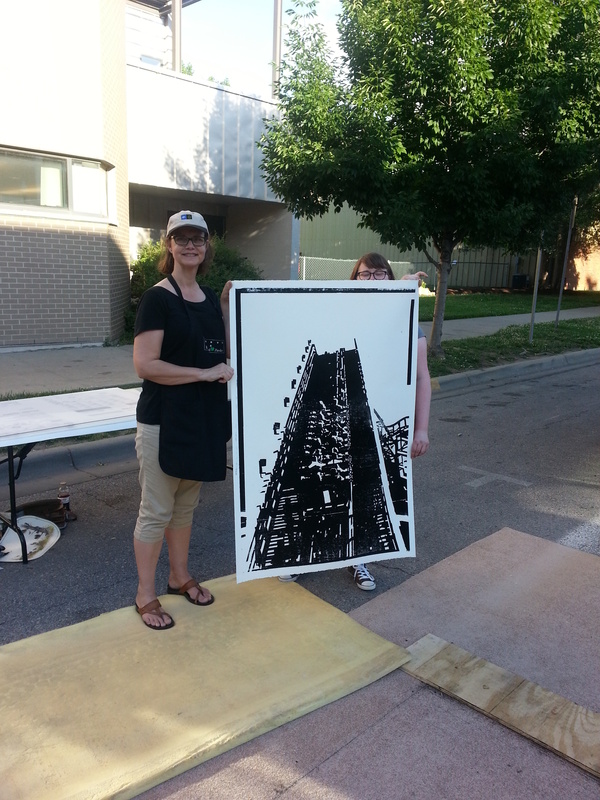 Primed my 48″x 32″ wood cut for tomorrows Lawrence Art Center’s Art Tougeau Steer Party. 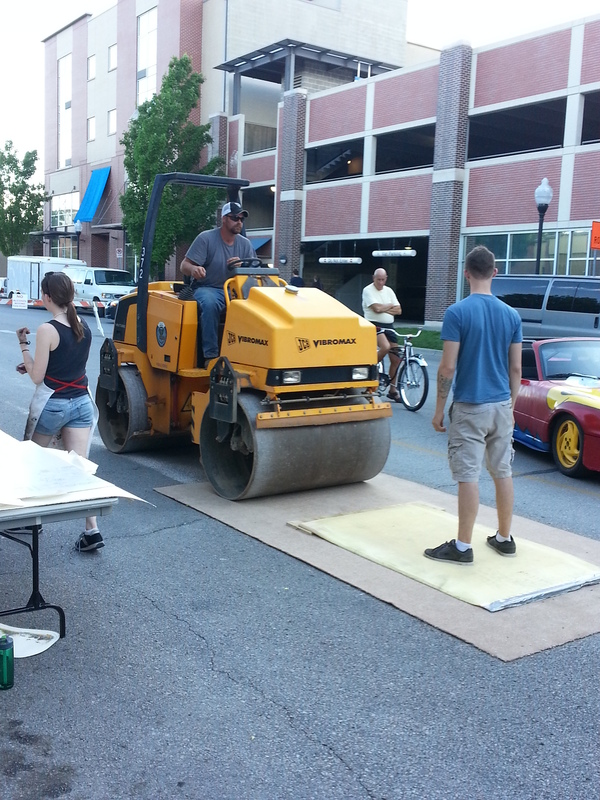 We are using a steam roller to print plates! Whew! 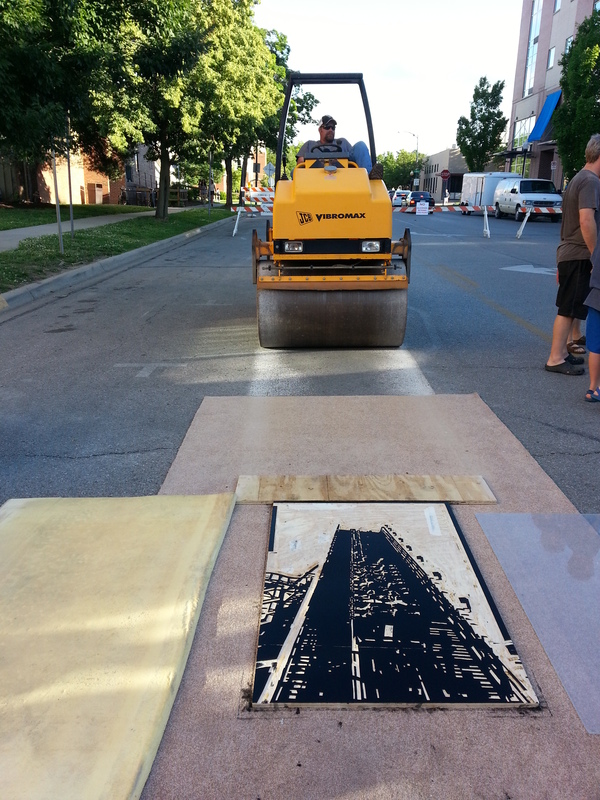 With a little lot of help from my husband my our Steam Roller sized wood cut is ready to travel to Lawrence! It will be inked tonight to allow an ink layer to soak in before being inked and printed on Friday night at the Lawrence Arts Center 2014 Art Tougeau event Friday night 5/28/2014 ! 5PM-9PM! 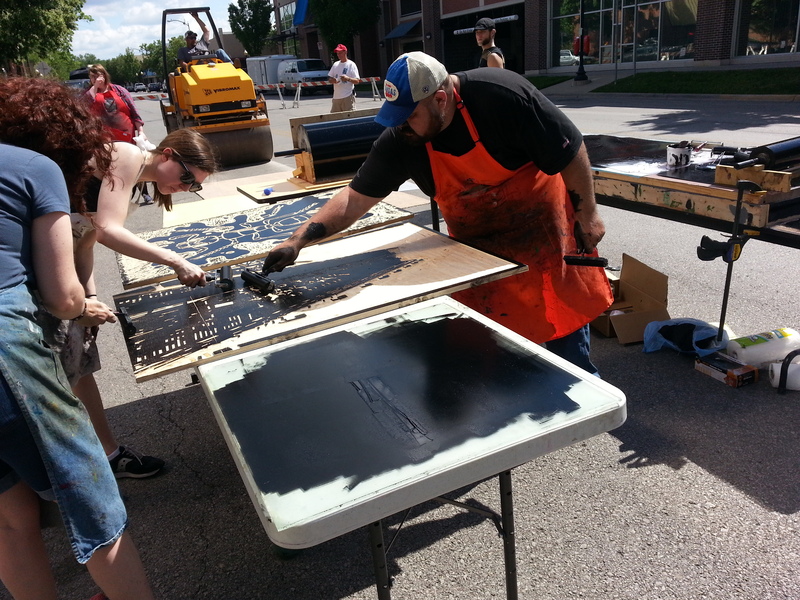 Yes a STEAM ROLLER will be printing this plate as it is 48′ x 32″. I started this class with a friend two months ago. Woodcarving isn’t one of my favorite printmaking techniques but I have always dreamed of doing large format work. It hurts my hands to do the cutting. Yes my tools and are sharp. It just doesn’t come naturally to me. It isn’t easy. I had high hopes that I would be a pro after completing a plate this large. I will be carving like a hot blade through butter in no time I told myself. We used a router to clear a lot at the top of image which helped. I also wanted a balanced image with as much black as white revealed which kept large ares untouched. 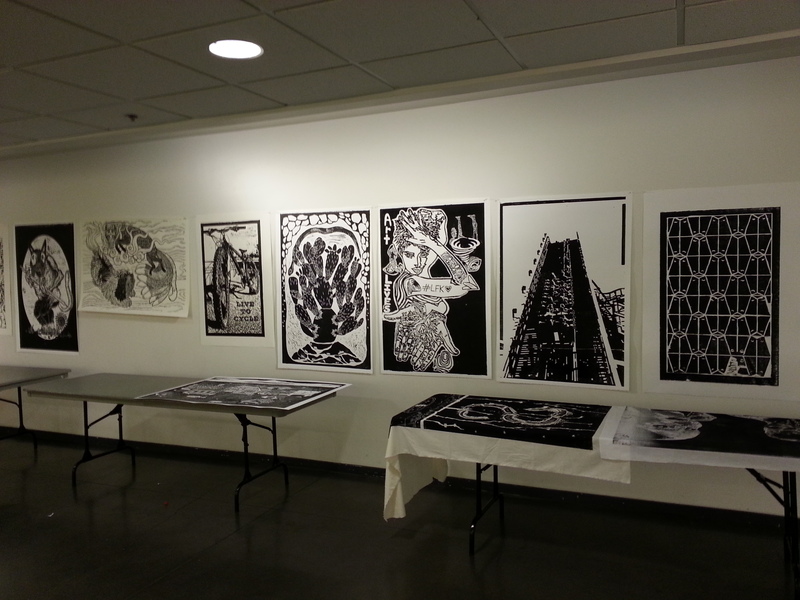 A previous client now wonderful friend emailed about this class at the Lawrence Art Center. She takes many classes there and is always inspired by the classes and the work she creates at the them. My friend is a life long learner which is why I adore her. Never one to fade from a challenge she loves to solve a problem. It would be fun! We would travel to Lawrence for Wednesday class from 7-9 nights for 6 or maybe it was 8 weeks? It would be causal knowing that we might not be able to make every class. My life especially evenings can can be unpredictable. My dual income clients need to meet in the evening. A project due date, a lacrosse game to watch my son in, a new confirmation class at church a son needs a ride too, umm dinner too?! Sometimes sheer exhaustion creeps in. I know when to call it a day! I know the feeling when not ONE more creative idea or inspiration will happen until I shut down and rest! So we skipped a few times ok let’s say many times! We knew what we needed to do. CARVE & carve some more! We checked in on some classes to see what other classmates were up too but class time was a chance to work and with the studio 45 minutes away travel time was better used for work time. My husband and I set up a card table in front of the TV and carved while watching reality TV (me) Royals (him). It reminded me of when we set up the same table to do puzzles. I had a set of carving tools from my intro studio I took years ago on Saturday morning at the University of New Mexico in Albuquerque. The tools have been living in a brown paper lunch sack for many years over 19 since I had them before my baby girl was born! I took them to class for a refresher on how to use them since my last attempt at carving was the lowest grade in my that classes portfolio. The tools may have been used to scratch etching plates as I preferred intaglio for years. The tools were useless! Deemed unsharpenable by my instructor! I returned home deflated and unsure how this large plate was gong to happen. I had tried a Dremmel but wasn’t thrilled. I didn’t have the skills to control it and it didn’t like the mark/cut it made. My husband carves wood neckerchief slides at Scout Camp each year. He also teaches scouts and leaders how to carve. Over and over he suggested I try the wood carving tools we inherited from my dad. I shrugged not understanding how these tools for carving a three dimensional object could be useful for carving a sheet of very flat plywood. THEY ARE THE SAME TOOLS! I was thrilled when my husband showed me all the tools we had. I am not sure what I like best this project: the sheer size, the image, working with my husband, spending time with my cool friend as we traveled to and from Lawrence or just holding the same tools my dad did. This project as many do started quietly then it grew legs of it own with many twists and turns. I listened quietly to the design/image and it told me many things and then started to run with a clear direction in mind! I will post an update of the inking and the print! stay tuned!